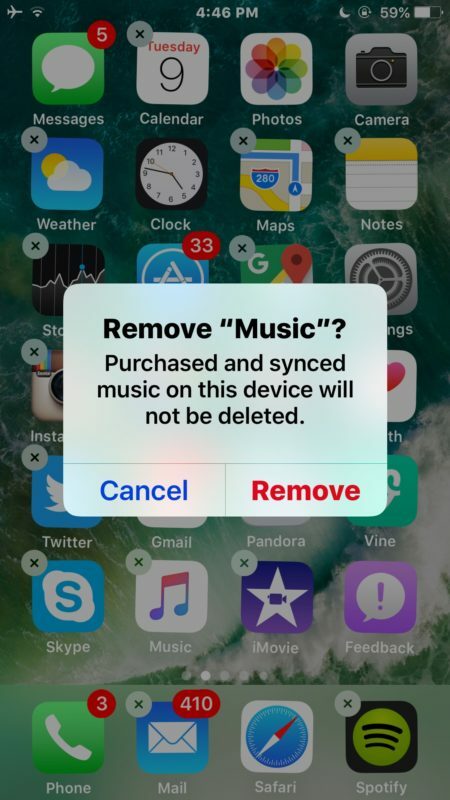 You can now delete defaults apps from any iPhone, iPad, or iPod touch running modern iOS releases. 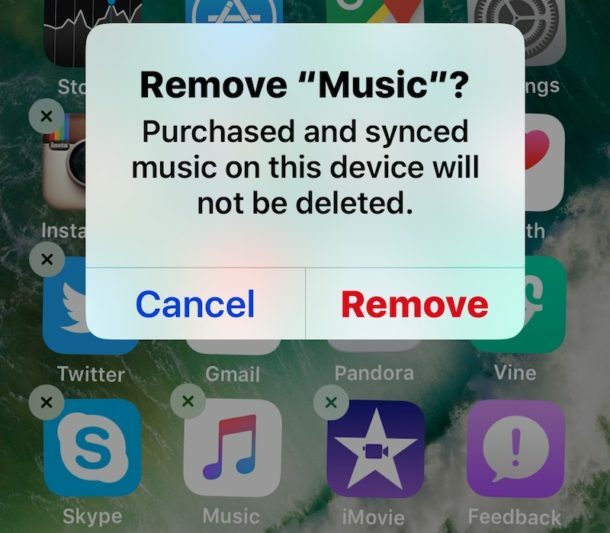 Yes this means you can delete Mail, delete Music, Stocks, Maps, Calendar, Watch, iTunes Store, Compass, Reminders, Videos, iBooks, Podcasts, Find Friends, Watch, Tips, Voice Memos, News, Activity, and any other of the pre bundled default iOS apps that arrive on iPhone and iPad, all of them can be removed easily. 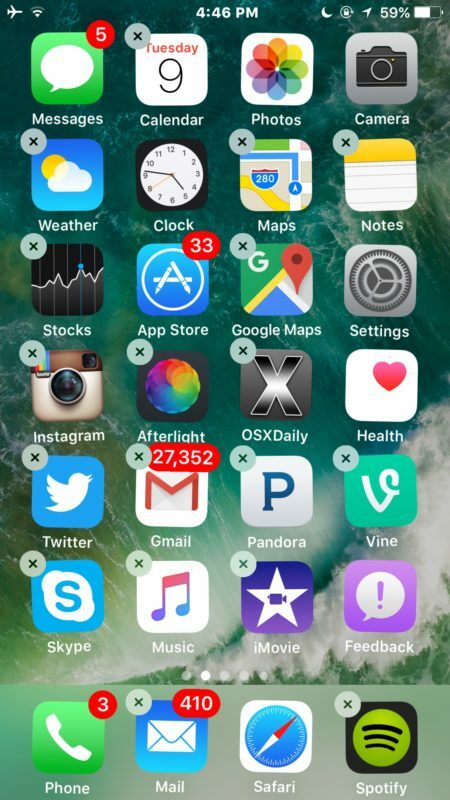 Any default app that has been removed can be reinstalled at any time, so if you decide it was a mistake to delete a specific app it’s easy to get back again. You’ll find that deleting a default app is basically the same as uninstalling other apps on the iPhone and iPad, except that up until now you could not delete the default apps, they were simply not removable. In the example here we deleted the bundled default “Music” app from iOS on an iPhone. The ability to delete default apps is really quite handy and it lets you cut down on some of the cruft that comes along with iOS which may go unused by some users. This feature to ditch stock apps though is only available in the most modern versions of iOS, so if your iPhone or iPad is running an older version of iOS system software you would need to update it to the latest versions available, anything past 10 will have the capability to delete stock apps, and try again to gain access to the deleting default apps ability. Note that some default apps can not be removed from iOS. Some of the undeletable apps include Settings, Messages, Phone, Safari, Clock, Photos, Health, App Store, and Camera. If you don’t want those apps, you’ll need to hide them in a folder or on another home screen. Even after a stock app has been deleted from the iPhone or iPad, they can be reinstalled again at anytime by going through the App Store, searching for the app in question, and choosing to re-download it again. 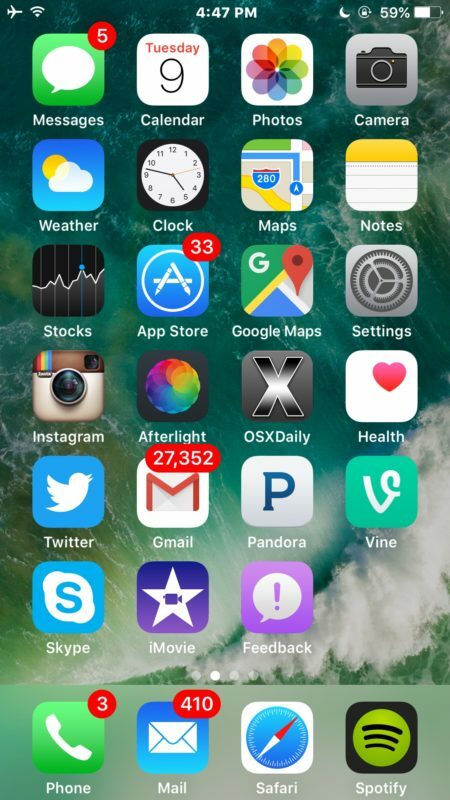 Does anyone actually want 90% of the default apps that come on iPhone?V I am very glad this feature to remove the stock apps exists in iOS! I deleted tips, stocks, itunes store, music, homekit, and many others, just no need for them at all. This is the first thing I have seen that I like about iOS 10 Haha!! Yes, this is a nice feature. I would delete “Health” too, if I could. Associated data is deleted, but it unfortunately doesn’t free up space for the apps themselves. I wonder why the App Store is required to reinstall them. Moreover you can’t change default associations, only “remove” the apps. You find pretty quickly that you need apps around to satisfy Siri, for instance. Default apps cannot be deleted. They can only be hidden. They still take up space on the device. On my iPad, the apps wiggle all right, but no X comes up to delete them. Why? I still cannot understand why Apple doesn’t make the apps that are able to be hidden in iOS 10 available as standalone apps in the App Store. They can preinstall them, but users should be able to completely delete them, similar to how Find My iPhone/Friends, iBooks, Podcasts, etc. used to be. It’s a great system for everyone and there’s really no reason to build things like stocks or voice memos so deep into the system. It would be nice to delete iMessage from my iPad, and the camera app. I disabled facetine and other nonsense. It is a shame Apple opts us into stuff without asking. I was able to delete all them dumb stuff from my macbook! I deleted or uninstalled some factory apps today. Then later I found out I needed the Videos app back. I went to the app store but could not find it there. I tapped on Updates and chose “All” but it’s not there. Chose “Not on This Ipod” and it’s not there either. What do I do now? To bad you still can’t remove wallet.